Tanzania is Africa’s finest destinations, the statistics speaks for themselves; An unparalleled one quarter of its surface area has been set aside for conservations purposes with the world renowned Serengeti National Park and incomprehensibly vast selous game reserve heading a rich mosaic of protected areas that collectively harbour an estimated 20 percent of Africa large mammal population Tanzania is a land of Mount Kilimanjaro – Africa highest mountain 5895 metres and magical spice island of Zanzibar the highlight of a vast Indian Ocean coastline studded with reefs swirling with brightly colorful fish and three largest lakes – Lake Tanganyika, Victoria and Nyasa (Malawi) Natural highlights abound such as Ngorongoro Crater the largest caldera in the world 264 sq km in size and 610 metres deep, Olduvai Gorge the best birth place of man, the 20 million year old ago Great Rift Valley and the vast game filled Serengeti Plains. More than 25 percent of Tanzania is dedicated as conservation areas, protecting over 20 percent of Africa large mammals and 35 percent of antelope, including 1.5 million wildebeest Annual great Serengeti migrations of millions of herbivores is a once in a lifetime experience It’s possible to see the big 10 animals in Tanzania buffalo, lion, elephant, rhino, cheetah, wild dog, leopard, hippo, zebra, giraffe and chimpanzees on the shores of lakes Tanganyika. Tanzania has over 1500 bird species with Lake Manyara National Park alone being home to more than 400. It is a year round birding destination, but at the height of the winter months some 160 species of migrants add to the variety The people of Tanzania are courteous, sincere, friendly, honestly sociable, respectfully and hospitable, making tourist feels extremely welcome!! Culture Tanzania is land of superb landscapes and spectacular wildlife, other attractions stands equally tall- the people. Tanzania’s people are the welcome and approachable on earth with a range of fascinating cultures ready to be shared with visitors, from Wachagga of the slope of Mount Kilimanjaro to the now world famous Maasai culture around Engaruka -the lost city in the shadow of the great rift wall. This can not end here, enjoy the last hunter-gathers in Africa, the Hadzabe Bushmen have made the area around Lake Eyasi their long time hunting grounds. Day trips or longer safaris with the Hadzabe Bushmen give visitors a chance to experience way of life. Morning hunts with the hadzabe warriors armed with bows and arrows, arrows offer a fascinating glimpse into a ancient way of life. Honey-gathering walk to find traditional healing plants and food and traditional dances are all part of the Hadzabe cultural tourism experience. Documentation A valid passport is required. Visas’ can be obtained on arrival at all points of entry and at the Embassy’s prior arrival. Required for all visitors who are not on the list of exempted countries. Citizens of some specified countries of Europe and North America may get visas at their port of entry in Tanzania – one of the International Airports, or the border ports. Visas are obtainable from any Tanzania Embassy or High Commission. For more recent/up to date visa requirements, contact your nearest Tanzanian Embassy /High Commission. You may also check with the UK based Tanzanian High Commission web site. Insurance It is strongly recommended that you take out fully comprehensive insurance including death, medical expenses, injury, delays, loss and damage of property. 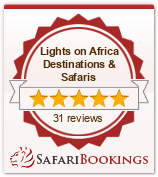 Lights on Africa Destinations will NOT held responsible for any such claims. NB: Tickets of medical evacuation (Flying doctor society) insurance are available on request. Liabilities All persons carried on the companies vehicles are governed by the respective laws of the land and all claims are subject to the jurisdiction of the courts of Tanzania. First Aid Sun block and after sun or sun screen lotion, Towel – travel towel is light and takes very little space, Skin cream, Insect repellent, Anti-malaria medication, non water/antibacterial soap – very handy in the Land rover etc. Book to read between game viewing and other leisure time, Cold/flu tablets, Allergy remedy, Some people take a basic antibiotic in case, Prescribed medicine (enough to last your trip) If you have specific medicine requirements then take it with as it might not be available in the areas you are going on safari in. General Binoculars (essential safari gear), Camera and film (can be expensive and/or difficult to obtain), lens cleaner If taking a digital camera: memory stick(s)/data card(s), charger and extra batteries Clothes Bright colors are definitely to be avoided. Clothing in neutral colors: khaki, light brown/green tan. Avoid bright colors and white for improved game viewing. Comfortable non-synthetic short- and long sleeved safari shirts, Comfortable non-synthetic shorts and long trousers. Sweaters for early morning game drive and cold nights and mornings Mountain wear and accessories Anorak, fleece, pants, short and long sleeves t-shirt, gloves, thermal underwear, hat, balaclava/woollen hat, walking boots, woollen socks, gaiters, crampons, sun glasses / snow goggles, thermal water bottle, head lamp, walking pole, toiletries, chronographic wrist watch, sunscreen lotion, lip salve, Swiss army knife, hand towel, four- season sleeping bag, day pack, first aid kit and back pack cover *. Luggage allowance: We recommend a soft bag weighing maximum of 10 to 15 kgs per person. A reasonable amount of photographic equipment is allowed. HEALTH Vaccination against cholera and malaria is recommended. Yellow fever vaccination is required for ALL persons from yellow fever endemic countries/regions. Please bring proof of your vaccination in the form of a stamped health card/certificate from your health center in your country of origin. It is advisable to bring anti-malaria pills, better still, to start taking the pills two weeks before arrival, during your stay, and after departure. CURRENCY REGULATION: It is forbidden to import or export Tanzanian currency. Any amount of foreign currency may be brought into the country. Foreign currency may be exchanged at any of the many authorized bureau de change located at major airports, border points, cities, towns and quality hotels in major towns. Demand and preserve your receipt for the transaction until departure. American dollar bills tend to fetch the most competitive exchange rates, although all major European and North American currencies can be exchanged. For security reasons, it is advisable to bring a sensible mix of travelers cheques and cash. Tanzanian Shilling (Tsh) = 100 cents LANGUAGE Swahili is the national language, but English is widely spoken. NATIONAL PARKS RULES Please observe rules of various parks for your own safety. These rules include discouraging you from feeding the wildlife, potentially interfering with the natural habitat that exits and making noise. Each group of 4 or more will have a head guide, an assistant guide, a cook, and 3 porters per climber. The head guide manages his own team who work together on every climb. Therefore, payment can be made to the head guide who will then distribute the tips to each person. It works best if you collect the group’s tips and then have one person pay the head guide at the Gate/Hotel after the climb. You may want to write down on a paper exactly what amount you want each person to receive. You can use US dollars or Local currencies to pay the tip. Head guide: Tip $25 for each day you are on the mountain Assistant guide: $12-$15 for each day on the mountain. There is some flexibility here, depending how helpful your assistant guide was. Cook: $12-$15 for each day on the mountain. Often acts as a porter and a cook. Porters: $12-15 for each porter and for each day on the mountain. You will have 3 porters per climber unless you bring extra gear or you have a large group that may require extra porters Note: Your tips for the guide, assistant guide and cook should be shared among your entire group. Each person should be responsible for tipping their 3 personal porters as well as contributing towards the other guides and cooks. Our recommendation is to use these Tanzania Tours & Safaris Travel Tips figures as a guideline, it is not a policy. These amounts may seem like a lot before the climb, but trust us, once you are there, you will appreciate our service. Please feel very free to contact us for more information.